You may have seen the fabulous gardens at Chanticleer in Philadelphia or Monet’s garden in Giverney, France (or the beautiful coffee-table books with great photographs of these gardens) and have admired the wonderful plant combinations that have been created there. The sophisticated mixtures of color and plant textures are magnificent. If only I could do the same in my garden, we think. We now have just the instructions and examples we are looking for. 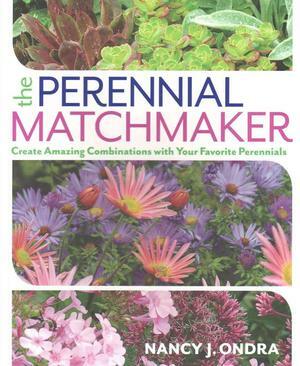 The Perennial Matchmaker by Nancy J. Ondra revels the secrets to mixing and matching harmonious plant partners. Part 1 of this book is titled Making the Perfect Match: a Plant-by-Plant Guide. Here is a list of 84 perennials with beautiful photographs, care guides, descriptions of each plant’s shape and texture, seasonal feature, and special effect. Ms. Ondra’s color-combination suggestions are what she calls ‘Bloom Buddies for Marvelous Matches for flowing combos’. The information is very thorough as she devotes an average of 3 pages on each of the 84 perennials in more than 250 pages. Part 2 is titled Perennial Matchmaking: Exploring More Options. Here is the how-to guide for planning a new garden, or for the rest of us, how to bring our existing shrub and perennial beds from nice to fantastic. Not only does she pay attention to picking the partners, she includes planting and caring for your combinations, seasonal effects, and troubleshooting any problems. Of most interest to me was the Partners beyond Perennial chapter. She covers ‘single season’ companions (annuals), bulb buddies, and ‘more permanent unions’ or showy shrubs for mixed borders. And yes, she has suggestions for matchmaking with our favorite hydrangeas. I wondered how I could have ignored this book before; but it is new, the copy write is 2016, so I didn’t overlook it in the past. If you have perennial borders, this is the gardening book to purchase this year. Nancy J. Ondra is a garden writer and editor. The majority of the 400 photographs in the book are her own. She lives in Buck County Pennsylvania.